(CNN) Hector Barajas is constantly dreaming about the day he'll return to the United States legally. On the eve of Easter, California Gov. Jerry Brown granted Barajas and two other veterans full pardons for crimes they committed before being deported to Mexico. Brown granted a total of 72 pardons and seven commutations Saturday. A pardon is usually granted to individuals who have demonstrated "exemplary behavior and have lived productive and law-abiding lives following their conviction," the governor's office said in a statement. The pardons could open a pathway for the men to come back to the United States, according to the American Civil Liberties Union of California. A veteran without US citizenship can be deported if convicted of various crimes. When the men's public records are cleared, an immigration judge could revisit their cases and halt their deportations, allowing them to return as lawful permanent residents, also known as green card holders. "Oh my God, this is huge. The process will be easier for me to go home to my family," Barajas said in a Facebook live video. "That moment when @Banishedveteran sees his pardon and realizes due to compassion of @JerryBrownGov he is on the path to come home! #NoWords"
"Hector Barajas, Erasmo Apodaca, and Marco Antonio Chavez Medina long ago paid their price for their mistakes, but their deportation has been the worst price of all, as they have been permanently separated from their families and the only country they knew," Jennie Pasquarella, director of immigrants' rights for the ACLU of California, said in a statement. 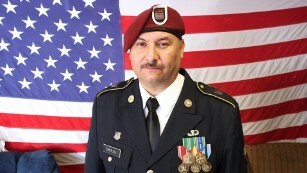 Barajas served in the Army's 82nd Airborne Division from 1995 until he was honorably discharged in 2001. When he returned to Compton, he struggled to adjust to civilian life. One night, he was arrested for shooting a gun from his vehicle. Even though nobody was hurt, he was charged with assault. He pleaded guilty to illegal discharge of a firearm and served two years in prison. "Don't worry about it, you service in the military, you'll be all right," Barajas told CNN. He was deported to Mexico.More than a decade has passed since Barajas was deported to Mexico, but he hasn't abandoned his dream of coming back to the country he calls home. 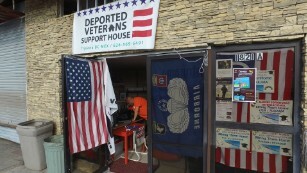 In Tijuana, Mexico, he supports fellow deported veterans in a two-story apartment covered in military posters and hung U.S. flags. When he was 16, Apodaca's parents brought him to Calexico, California. As a lawful permanent resident, he joined the US Marine Cops after graduating from high school. During Apodaca's three years of service, he was deployed to Iraq in Operation Desert Storm. He earned a national defense service medal and other military honors, according to this pardon. In 1996, he broke into his ex-girlfriend's house when he was drunk and stole $500 worth of goods, his pardon explains. He was convicted of burglary. While he was in prison, Apodaca was part of an inmate program that allows him to fight fires with trained firefighters, according to the San-Diego based group Honorably Discharged, Dishonorably Deported. He was deported in 1997 after serving a 10-month sentence. Chavez grew up in Los Angeles after he arrived to the US with his parents in 1973. He was just 1 at the time. At 19, he enlisted in the Marine Corps and served for four years. In 1998, he was convicted for animal cruelty and served 10 months in prison. An immigration judge considered his conviction an aggravated felony, which led to his deportation in 2002. In an effort to stay together, his family first moved with him to Tijuana, Mexico. After a while, his wife continued struggling with the language barrier and the daily commute back to the US for work. Chavez' wife and three sons moved to Iowa, according to Honorably Discharged, Dishonorably Deported. CNN's Gabe Ramirez and Daniella Diaz contributed to this report.